ChromaBlast heat transfer paper is the professional's choice for digitally printing white and light colored t-shirts, tote bags and other cotton fabrics. ChromaBlast digital garment printing solution rivals that of expensive direct to garment printing systems. Unlike conventional heat transfer paper found in your local office supply or craft store, ChromaBlast's patented chemical process sets it apart from any other form of digital cotton printing. As heat and pressure are applied during pressing, a cross-link occurs between the cotton, ink and media which transfers and binds the image into the cotton fibers. 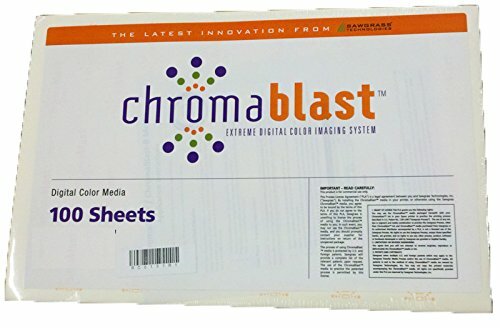 ChromaBlast Transfer Media is available in 8.5" x 11" (A4) or 11" x 17" (A3+) sheets. If you have any questions about this product by Sawgrass, contact us by completing and submitting the form below. If you are looking for a specif part number, please include it with your message.